Two years ago we moved to Bruges, to a lovely appartement with a stunning view on Bruges, the most beautiful city of Belgium, the town where I was born! Photo opportunities gallore, within walking distance of where I live. As you can see, my hubby is in perfect shape, and we're very very happy here! 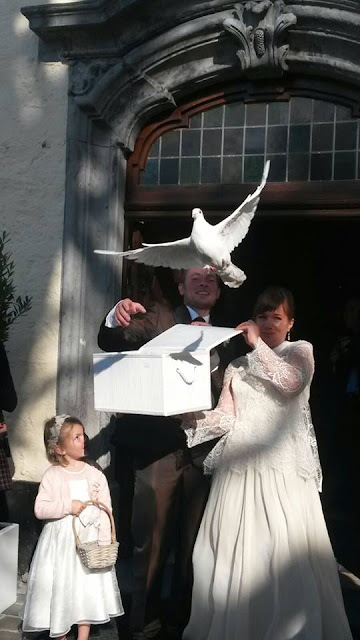 Two years ago my lovely daughter Valérie got married to her knight on a white horse Peter. It was a lovely day, a fairy tale wedding, complete with sunshine and nice weather. She got pregnant and gave birth to the cutest little baby you've EVER seen! Believe me! I know I KNOW, I'm her proud grandma, and I love her to pieces! Our other daughter Patsy is very happy with her husband Geert. They look radiant, don't they? My little sister ( and my other sister ) live right across the street, and we are now able to spend a lot of time together. Cats rule in her hous, LOL! Yesterday the Easter bunny brought some presents for Olivia. Isn't she pretty? Ok, Blogger won't let me post any more pictures right now, but I'll be back tomorrow because I have a hell of a lot more to show you! There was a birthday party for my father who is turning 85 this weekend, there are cure baby pictures, pictures of Bruges... Plenty to show you! I hope you are all doing well, please let me know? Bye for now, I really do hope you are still reading this blog! So good to see your blogging again! WHat a surprise. Nice to see you back and can't wait to see Bruges. I've heard it's beautiful.